Thanks my friend,,, i searched a lot of site but couldn’t get the solution. Excellent. My company IT guys spent 1 our and coul dnot figure it out. It took me one minute to fix after I learned it from YOU! Its worked. Thanks a lot…. Thank you – this has been driving me crazy. Thank you so much! That fixed my problem. Thank you – this swiftly solved a really annoying problem! THANK YOU!!!! I was going nuts…stupid Windows 10 upgrade. Thank you v much, it worked like a charm!….I agree, Windows 10 is a crazy upgrade! It worked! Bless you, now I can continue to coexist with my boss. 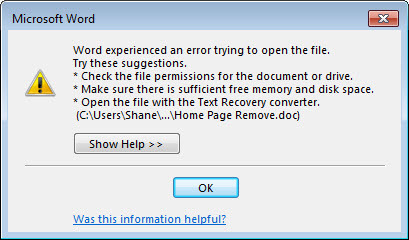 MS office 2016.. doesn’t have this option as shown, is that other way to make it works? It is in the same exact location as Word 2013… I just double checked it. I found another (I think better) solution. Started the Office Installer, chose Repair, hit “next” a couple times and let it to its thing. Problem solved! This solution seems better to me than disabling safety features, since some Word and Excel files can contain macro-viruses — that’s why MS added in these safety features in the first place, and that’s why I wouldn’t recommend disabling them! Please can I have the solution for a mac book pls.this same issue. This was really giving me a headache and I googled the solution one last time and your answer worked first time! Thank you so much, very grateful! Thanks a lot.It works perfectly fine for me.Great Solution.